A major stealth campaign to legally enshrine Christianity in states all over the country is being forced into the public eye, thanks to dozens of leading constitutionally minded groups, such as the Freedom From Religion Foundation. “Project Blitz” is a coordinated national effort by the Congressional Prayer Caucus Foundation and others to incorporate Christian nationalism in state laws across the country. It promotes a three-tiered framework of state bills intended to incrementally redefine religious freedom to tear down the separation of church and state, with each tier laying the groundwork for the next. 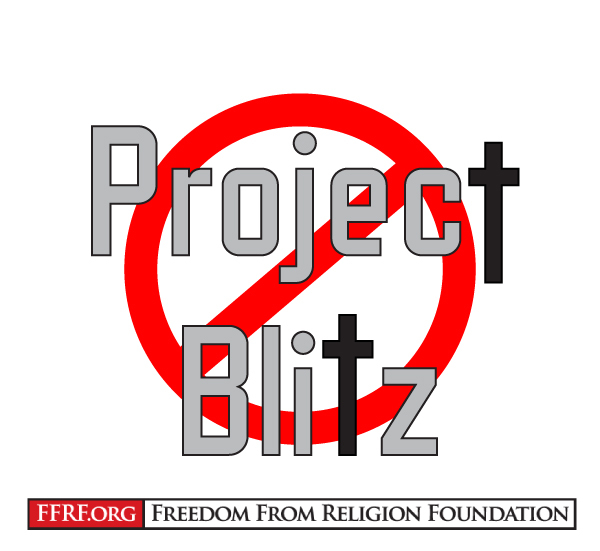 Religious freedom is a fundamental American value, FFRF and the 42 other organizations, which range from American Atheists to Muslim Advocates, maintain in a joint statement spotlighting Project Blitz. But Project Blitz is out to breach the wall of separation. Therefore, FFRF and other secular organizations urge legislators across the nation to oppose Project Blitz and similar efforts. America is stronger when the government gives no set of religions or beliefs more power or preference than any other — and when everyone is welcome and treated equally under the law. The Freedom From Religion Foundation is proud to be part of this combined initiative, organized by Americans United for Separation of Church and State, to preserve our secular values and ensure that the nefarious “Project Blitz” project to undermine our Constitution doesn’t succeed. A list of the 43 signatories is available at the end of the statement.